Videos, examples, solutions, worksheets, games and activities to help Algebra students learn about the product rule in logarithms. 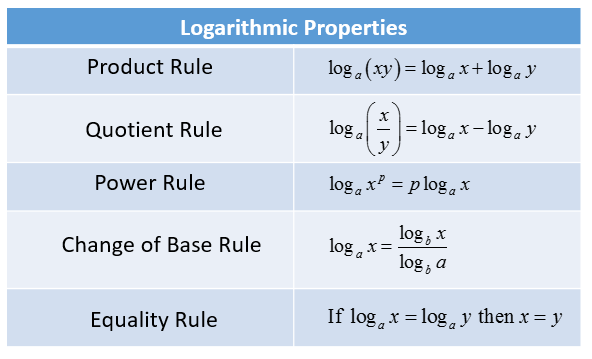 The following table gives the logarithm rules. Scroll down the page for examples and solutions for the Product Rule. What is the Product Rule of Logarithms? The log of a product is equal to the sum of the logs of its factors. How to use the product rule for logarithms? How to expand Logarithms using the Product Rule for Logs? Use the product rule for logarithms to rewrite the logarithm of a product as the sum of logarithms of its factors. Expand each logarithm as much as possible. More examples on how to expand logarithms.